A new study published in the Duke Journal of Gender Law & Policy found that it's not just what the Supreme Court decides in its historical decisions that is important — its how the decision is written that matters as well. 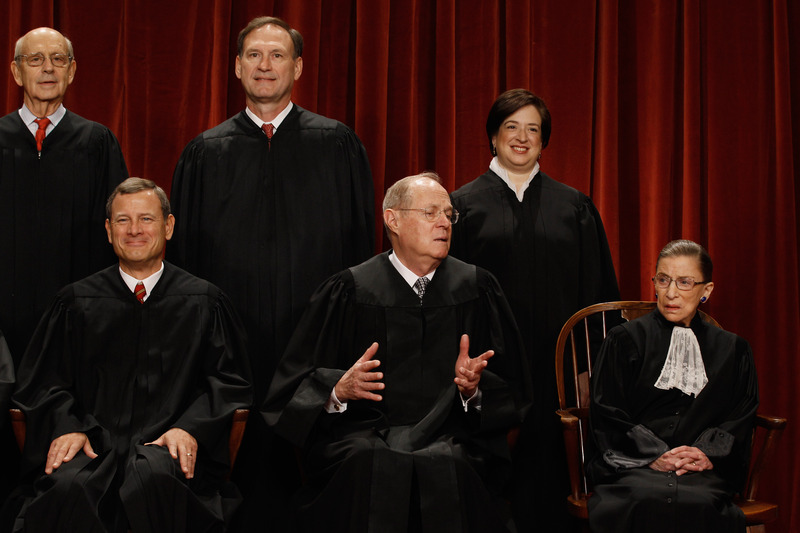 The study, "The Supreme Court and Gender-Neutral Language: Setting the Standard or Lagging Behind?," found that two SCOTUS justices use gender-neutral language in their writing, and they use it often enough that it doesn't seem accidental. Because the Court and its decisions have huge effects on social and cultural interactions, this is a pretty big deal. If we want to make a move toward gender equality and against gender binaries, it's probably pretty fundamental that we stop referring to all people with the generic "man," and these justices understand that. Leslie M. Rose, author of the study and a professor at Golden Gate University School of Law, wrote that Supreme Court justices are the most influential members of the legal community, and they should use gender neutral language "to avoid subtle sexism, distraction, and ambiguity." Further, she said law students are constantly reading case briefs from the Court, so the writing of its justices should provide models that students can follow. Rose examined at least 15 opinions by the nine justices and found that two of them used obvious, positive gender-neutral techniques, by pairing or alternating pronouns, for example, consistently enough that the choice didn't seem like an accident. Justices Samuel Alito and Ruth Bader Ginsburg are the two badass justices who qualify as gender-neutral writing trendsetters for the Court. The principles of qualified immunity shield an officer from personal liability when an officer reasonably believes that his or her conduct complies with the law. Police officers are entitled to rely on existing lower court cases without facing personal liability for their actions. In Gall v. United States, Alito even pushed back against his fellow justices a little bit. Former Justice John Paul Stevens used only male-gendered pronouns in his majority opinion in the 2009 decision, and Scalia used a male-gendered generic to refer to criminal defendants generally, according to the study. Alito wrote all of his dissenting opinion using gender neutral and plural pronouns, and I hope he brushed his shoulders off when he was finished. The most consistent pattern in her writing is to assign particular generics to particular actors throughout all her opinions, most noticeably by using female pronouns to refer generically to judges and to plaintiffs in civil cases, and by using male pronouns to refer to criminal defendants and prisoners. Fourth, a nonparty is bound by a judgment if she “assume(d) control” over the litigation in which that judgment was rendered. Because such a person has had “the opportunity to present proofs and argument,” he has already “had his day in court” even though he was not a formal party to the litigation. As a feminist, I want to high-five Notorious R.B.G. and her amazing gloves for this effort. But I do wonder if she isn't undercutting the move toward gender neutrality and against gender binaries by not adopting more neutral plurals like Alito. Regardless, the move against Court opinions that only use the generic "man" to represent all people is a move for the best.